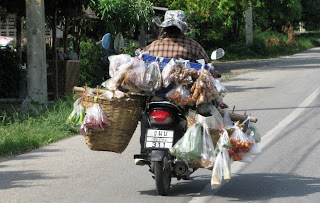 Welcome to my eclectic online travel guide and blog, featuring amusing anecdotes and entertaining stories about my journey's around Thailand and South East Asia.The website also offers a wealth of hints, tips and practical travel advice. Whether you're a seasoned traveller or it's your first trip, my website will give you all the information you'll need to plan the perfect getaway. Well the title of this post says it all........according to official figures more Aussies come a cropper in Thailand than any other country!!! In 2008-09, a total of 1038 Australians died whilst on holiday overseas and Thailand which received 378,000 Australian visitors accounted for 105 of those deaths!!!! It is lucky that England won the Ashes or that death toll would have been a lot higher!!!! So statistically, your average Aussie has got more chance of winning a test match, by bowling underarm, and wearing a tutu and flip-flops, as they have of staying alive in Thailand!!! It doesn't bode well for Dame Edna or Skippy, so you'd best lay off the sang som and coke guys and watch ur back!!! Why is it that so many Australians end up croaking in the Kingdom? Are they complete clowns who couldn't find their arse with both hands or are they just plain unlucky? 10 Beers + large spliff = impaired mental faculties (x journey on poorly maintained motorbike (- crash helmet) + pot-holed roads = limited life span. But it is hard to argue against my theory when Australia's only contribution to the betterment of the English langauge is Alf Stewart's classic ..... "you flaming gallah". And you have to shake your head in bewilderment when you hear quotes like these from former Australian cabinet minister Keppel Enderbery - "Traditionally, most of Australia's imports come from overseas". Before my British readers rest on their laurels and smugly proclaim any sense of superiority, we are also guilty of recklessness and downright stupdity which resulted in 269 of my fellow countryman being killed in Thailand in 2008. So my advice to any would be Travellers to Thailand, is to keep your wits about you, don't put yourself into any compromising positions and do your reserach before you travel.......and last but not least, make sure you have travel insurance!!! The number of people who travel aborad without any kind of protection astounds me!!!! Talking of protection....if you are going to avail yourself of the services of a nubile young go-go danceer or two, then make sure you're stocked up with party hats, as you don't want to take a case of "Bangkok todger" home with you. The nightlife in Thailand is the stuff of legend and a thousand bar room tales. When I first visited the "Land of Smiles" back in 2003, I will readily admit that I was more than a little naive. I had heard stories from friends and acquaintances about the shannanigans that went on, but dismissed most of it as jocular pub banter, but little did I know that most of the eye-opening anecdotes were actually true!!!! Arriving in Bangkok, I can remember approaching the "naughty bar" scene with a sense of trepidation, coupled with a feeling of sheer unadulterated joy, like finding the golden ticket to visit Willy Wonkas chocolate factory. The aim of my post is too introduce first-time visitors to the nightlife in Thailand, guide them through the complexities and hopefully help them to avoid any pitfalls. I shall start by giving you the low-down on the types of entertainment venues that you are likely to encounter. Apologies for the lack of posts recently, I have been in Chiang Mai with my girlfriend renovating our holiday home....I will update you all on the progress of the improvements and post some photos in due course. 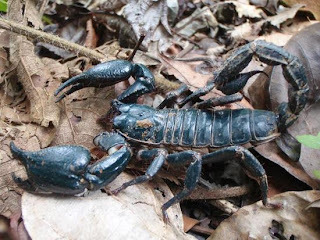 Having recently encountered a massive scorpion in the garden, (see below!!! ), it got me thinking about all the potentially dangerous creatures that you are likely to encounter in Thailand. There are plenty of run of the mill critters like ants, wasps and bees, ands although a bite or sting can be extremely uncomfortable, they are only really dangerous if you suffer an allergic reaction. However, there are plenty of other flying, slithering and swimming critters that can pack a lethal punch. I shall give you a breakdown of some of the worst offenders………. One of the smallest and most common insects is responsible for more hospital admissions than all the other animals combined and that is the humble mosquito. The first rule of driving in Thailand is: Don't! The second rule of driving in Thailand is: Don't! It's incredible to think that a race of people who are inherently kind, friendly and forgiving turn into complete psychopaths when sitting behind the wheel of a car or riding on a motorcycle.